The casual observer, viewing modern car crash damage, may believe today's cars are delicate, poorly-designed machines. They're wrong. These vintage crashes show old-timey cars in lower-speed crashes would disintegrate, along with, potentially, the occupants. The difference between a modern car and a vintage car is new cars are designed to wrinkle up and bend in specific ways, redirecting the forces of the crash to protect the passengers. To explain why this is important, let's take a quick look at the physics. For starters, there's Newton's second law of motion, force = mass x acceleration. The equation conveys, in our scenario, that as the time it takes for an automobile to come to rest or change direction is increased, the force experienced by the automobile (and its occupants) is decreased. Conversely, if the time to stop is shorter, the force experienced is greater. Aluminum and plastic "crumple zones" add time to the crash by absorbing energy. Prior to 1959, people believed the stronger the structure, the safer the car. But in actuality, such construction proved deadly to passengers. Old steel was designed for durability, which is great if you like keeping your car around for generations, not so great if you're interested in transmitting all of the forces of a crash around the passenger compartment. So those "crumple zones," first found in the 1959 Mercedes Heckflosse, allow the front of the vehicle to crush like an accordion, absorbing some of the impact of the collision and even giving off some of that energy in the form of heat and sound. The front of the vehicle effectively acts as a cushion to slow the time it takes for the vehicle to come to a complete stop, applying less force on passengers. 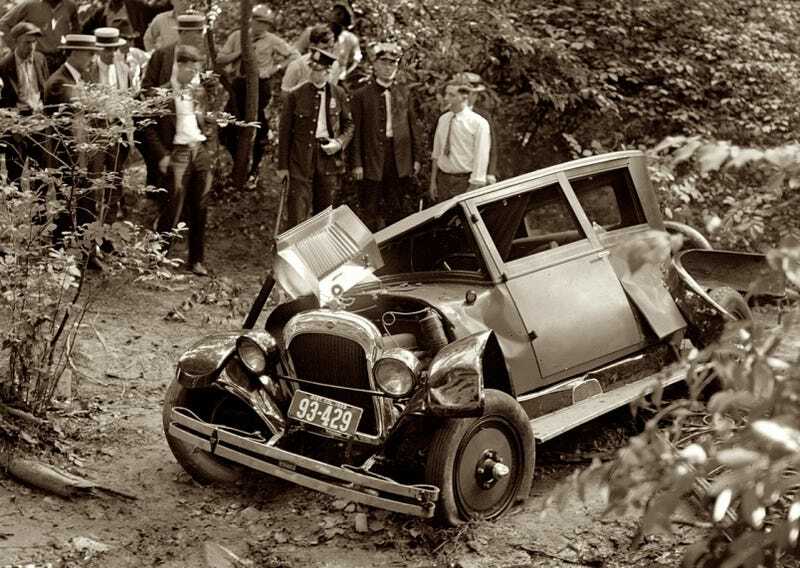 The redirection of harmful forces during a crash is what allows the occupants of modern cars to survive crashes, even at the much higher speeds modern cars travel at, than vintage vehicles could ever achieve. So you know, it's all about the physics and stuff.